Koyo, or Fall Colors in Nagoya | H&R Group K.K. The Japanese are very conscience of the seasons changing around them, often celebrating little, or not so little, milestones between each to mark the transitions between their much touted “4 distinct seasons.” Long sleeve or short sleeve shirts for example are there one day, but gone the next as the season officially ends for them. Similarly, spring and fall enjoy their own milestones, “hanami” and “koyo,” and taking a moment to enjoy “the moment” of each is a national obsession. Viewing the changing colors of fall leaves, which is called either koyo or momoji in Japanese depending on the type of tree viewed, is autumn in Japan’s answer to the more famous cherry blossom viewing of spring; a tradition chance to get outdoors to live in the moment of the season, and to reflect on the impermanence of it all. Since ancient times in Japan this urge to experience the beauty of the changing seasons has been custom; you can find it referenced in the classical Heian Period (794 to 1185) novel “The Tale of the Genji;” one of the world’s first novels. In modern times the passing of summer into fall comes with a great sense of relief and a greater sense of physical comfort with the easing of the summer’s oppressive heat and humidity. For the first time in months, the idea of being outside for a picnic or short walk in the park does not sound like an ordeal to be overcome. Starting in mid September the “koyo front” slowly moves its bands of color south from Hokkaido to central and southern Japan and the end of November where it turns to winter, and many families will head to local parks, or to the mountains and countryside to enjoy the cooling temperatures and spectacular views of changing leaves. While some people celebrate the leaves much like they do the flower petals of spring, by spreading out a blanket beneath them for feasting and much drinking, it is more common for koyo to be celebrated by taking a short hike or walk through the mountains, or often in certain areas of the city, where the trees can be found. Nagoya usually enjoys its turn in early to mid November. If you are looking for an excuse to go play outside this a a good one. Why not try one of these spots in the Nagoya area? The most famous, and crowded, of these local areas to enjoy koyo is Korankei Gorge in Asuke City; near Toyota City. Korankei is a beautiful ravine that connects the Tomoe River and the Iimori Mountains. Its 4,000 maple trees, reportedly planted by local monks, explode with vibrant red, yellow, and orange leaves every fall and bring throngs of families and couples during the season to this small town. Korankei’s maples begin to turn in October, but usually reach full color in early to mid November. Starting November 1st, the trees will be lit from below by floodlights, giving the area a magical atmosphere where couples can be seen walking hand in hand. Many of Korankei’s 4000 maples remain “illuminated” the entire month of November; daily from sunset until 9pm. There are plenty of stalls selling food and drink, and more than enough park to wander a couple of hours in. Though difficult to get to due to heavy traffic this is a highly recommended destination! If you are coming by car take route 153 from Toyota city to Asuke City. There is always a lot of traffic during the month of November, and it may take you quite some time to get there and parked before you can enjoy the scenery, but it is worth the trek! Located next to the Tokugawa Art Museum, which features diverse and impressive collections built and handed down through the Tokugawa family line, Tokugawaen is a garden designed in the mainstream style of major daimyo gardens from the Edo period. In it, a clear stream flows from a waterfall through the ravine until it reaches a pond representing the ocean, symbolically condensing the landscape of Japan’s natural splendor. The garden is lovely in any season, none more so than fall. You can get there on the Nagoya Kanko Route Bus leaving from bus stop 8 in front of JR Nagoya Station, Or use the directions from this site: website. Like Tokugawaen, this is another beautiful Japanese garden with a real historical feel and a natural world theme. Covering more than 3.5 hectares, it is an expansive garden of ponds, copses and rivers, the main one of which is to represent the Kiso river and stems from a large mound representing Mt. Ontake. In the fall months the garden is a mass of greens, golds and yellows, and though many locals come to wander around taking photos, it is large enough to not feel crowded. When you have finished, why not take a break to sit in the Seiu-tei, a complex of tea ceremony rooms built in the image of a swan, or ‘shirotori’, flying down to rest its wings. Although Okazaki Park is best known for being listed among “Japan’s Top 100 Cherry Blossom Spots”, is also well worth a visit during the autumn when the leaves begin to change. Trees fill the park, line the Oto River and surround the castle. When in the area, take a moment to revel in the park’s history as it has a long association with samurai. The nearby Mikawa Warrior and Ieyasu Museum, dedicated to the great shogun Tokugawa Ieyasu who was born in the castle, is well worth a visit. Near to the Nagano border, this stunning mountain is the tallest in Aichi and a popular ski resort in winter. However, in the fall its slopes are beautiful to walk amongst as the trees that line them go through their annual change, turning all the shades of gorgeous golds and reds, against the backdrop of the clear blue mountain sky. Starting in in mid-September and going on until early-November is the Aki-no-Chausuyama Kogen Matsuri (fall festival), but the best time to visit is in October thanks to the nightly illuminations setting the trees aglow. The website for last year’s event can be found here. Due to its location it’s not the easiest of areas to access and you’ll need a car to get there, but if you can make it, and have the energy for the climb, the views certainly make up for any difficulties. About an hour outside of Nagoya, in Gifu, Yoro no Taki, or Yoro Falls, is located in Yoro Town. The waterfall itself is about 32 meters high, 4 meters wide, and is one of Japan’s top 100 waterfalls. The water from the falls is famously high quality, and is said to have rejuvenating powers. It can be reached by taking the JR Tokaido Line from Nagoya Station to Ogaki Station (30 minutes, 740yen). From Ogaki, you must transfer to a private rail line for the remaining leg of the journey to Yoro Tetsudo Station (25 minutes, 400yen). From there it is about a 20 minute walk to the park, or a quick cab ride if you prefer. Inuyama Castle sits below Inuyama City, overlooking the Kiso River and across that Gifu Prefecture. Inuyama Castle is one of only 12 castles in Japan still standing that were built before the Edo period, and until recently was the only castle in Japan still in private hands. The previous owners, who had nearly continuously held it since the 1600’s, turned it over to the City of Inuyama in 2004. The castle and surrounding area is lovely in fall, and a walk along the river is almost as good as visiting the castle itself! The castle is 15 minutes walk from Inuyama Yuen Station on the Meitetsu line, about 40 minutes outside of Nagoya. Jakkoin Temple, or “Owari nomomijidera” is probably one of the best places on this list, but the least accessible. The temple is halfway up a mountain, and requires some hiking to reach it. My suggestion would be to start at the castle and afterwards work your way up the river on foot, then head up Mt. Tsugao to the temple. Off the top of my head, this is less than an hours walk and approximately 15 minutes hiking up the mountain from the riverside. 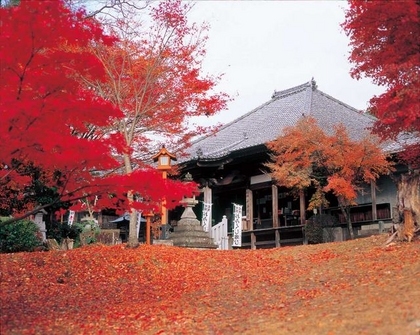 The main hall of Jakkoin Buddhist Temple is emblazon with over 1,000 Japanese maples every fall, and their fiery reds and orange are quite lovely. Besides the temple itself, its position on the mountain affords the intrepid visitor a view of the surrounding area below, which is also quite colorful. So you probably know all about the sakura, or cherry blossom, in spring, but were you aware that some species also blossom in fall too? The sakura variety that grows in the small Aichi town of Obara is called Shikizakura (four season cherry blossom) and it blooms twice in a year, once in spring and again between October and early December, just at the same time as the other trees in the area are turning red and golden. This phenomenon – at which you can see the turning maple and the blooming blossom, brings thousands of tourists to the town each year. If you feel that your autumn hunt for turning colors a bit of adventure, is all too easy? If that is the case then you should head to Mount Horaiji (Horaijisan) near Shinshiro. With 1,425 stone steps, the trail that leads halfway up the mountain to the 1300 year old Horaiji Temple takes some doing, but you will be rewarded with some stunning scenery as the temple sits below a massive sheer stone cliff face and all around you can see the gorgeous turning trees. Until November 30, 2017 the area is the location for the Horaiji Maple Festival takes place, where all manner of events are staged and local specialties are sold. November 23 is the main day of the festival and if you can make it then, there is plenty to do besides the majesty of the autumn leaves. Details of the Mt Horaiji Maple Festival.